In my quest for more funny reads this year, I turned to P.G. Wodehouse and an audiobook of The Inimitable Jeeves. I am happy to report much hilarity was found. This is the thirdish Jeeves book I’ve read–the previous two were both short story collections and turned out to have some overlapping. This one was more properly a novel, but still very much episodic. 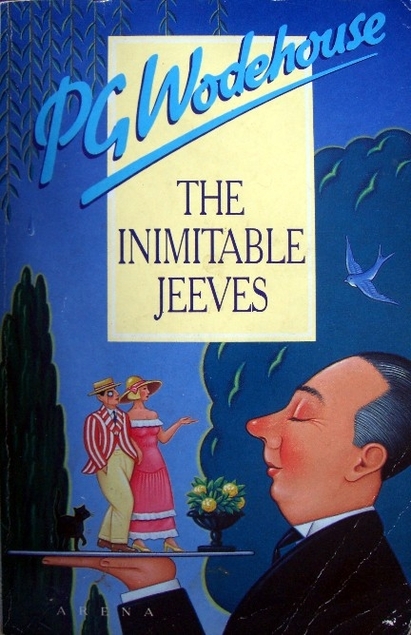 The premise was much the same as it was throughout the short stories: English gentleman Bertie Wooster gets into some sort of social scrape–or has a friend in said-scrape, in this book frequently Bingo Wilcox, who falls in love a good half-dozen times throughout the book–and turns to his utterly unruffled manservant Jeeves for help. Or, alternatively, he tries to go it alone because he and Jeeves are on the outs, probably because Bertie is making a firm stance around a flamboyant article of clothing which Jeeves disapproves of. Either way, Bertie usually manages to make the situation worse before Jeeves ultimately solves it with an ingenious manipulation of human nature. These are definitely a very particular type of humor. Bingo and Bertie and the various other people drifting through their lives (or careening madly through, as the case may be) are fairly zany, but Jeeves’ calm understatement is frequently the comedy gold, in a very dry sort of way. I’ve never read Wodehouse in print, only audiobook, and the reader may add to the fun. I’ve been listening to him read by Frederick Davidson, and he does an excellent Jeeves voice–unruffled, controlled, unemotional no matter the situation or what he has to say. These are also, of course, exceedingly British in a deliberate stereotype kind of way, with plenty of London and also adventures in the countryside. The best section, perhaps, is when Bertie’s friends, looking for some diversion in the country, start placing bets on the minister’s sermon lengths, with the longest one the winner–all with carefully devised handicaps and marvelously misapplied horse race terms. Bingo’s hapless romances also lent a nice through-line to the book, linking (if loosely) the various episodes. It was a little more satisfying than the short story collections. This was the best Wodehouse I’ve read to date, and the funniest book so far this year–but we are, after all, early in 2019 yet! Sounds like a fun read. Does it assume some knowledge of the British class system and British terms?